Happiness for toddler-aged Craig Johnson was a folding chair and frozen lake. Oh yeah, and a pair of skates. Johnson might as well have been born wearing skates. He was the ripe old age of 3 when he stepped out of his footie pajamas and was strapped into his first pair of blades. Johnson’s father, Dwight, would take him the five blocks from their family home in St. Paul to Lake Como. They would spend the day there. Many, many days there. The pint-sized Johnson learned to skate as he pushed that chair for hours upon hours, stopping only for the occasional rest break. Dwight Johnson insisted his son learn to skate before he played hockey. Conveniently, the Midway Skating Club made its home on Lake Como. The club’s impeccably groomed speedskating oval was an ideal place for a skating-obsessed kid to hone his skills. By the time Johnson was in the third grade, his father made him choose between speedskating and hockey. “You can’t do both,” Dwight Johnson told his son. Johnson chose hockey, but there remained a speedskating element to his game. 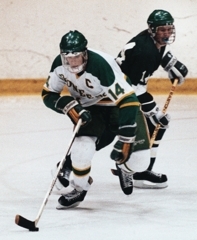 St. Paul’s Como Park neighborhood wasn’t routinely producing top-flight hockey players in the late 1980s, so Johnson was a bit of an unknown commodity when he showed up for Hill-Murray tryouts as a sophomore. Johnson scored 14 goals and added 20 assists in 28 games as a sophomore. His considerable presence helped give Hill-Murray the depth to push all the way to the 1988 state championship game. The Pioneers beat Rochester John Marshall 4-3 in the quarterfinals and downed Bloomington Jefferson 6-3 in the semifinals. Edina beat Hill-Murray 5-3 in the title game. Johnson would score 52 and 51 points as a junior and senior, respectively, but he never again reached the tournament. 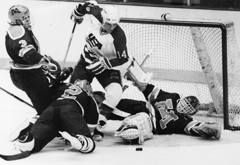 Hill-Murray lost to White Bear Lake in two overtimes in the 1989 Section 3 semifinals. The Pioneers were upended by Park (Cottage Grove) in three overtimes the following year, again seeing their season end in the section semifinals. Despite the disappointments, Johnson’s passion for hockey never waned. “He came up with some things on the ice that coaches don’t teach,” Schafhauser said. “You could see what made him an outstanding player; he was creative and he loved to play. 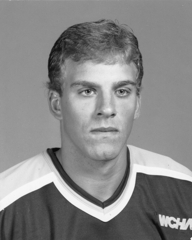 One of five Mr. Hockey finalists in 1990, Johnson headed to the University of Minnesota after high school. He scored 42 goals in three seasons, leaving early to join the U.S. national team and play in the 1994 Olympics. Johnson played 10 seasons in the NHL, appearing in 557 games. He retired from pro hockey in 2007 and lives in Irvine, Calif. He remains heavily involved in hockey, serving as the director of coaches for the Anaheim Junior Ducks. Johnson said he and former NHL all-star defenseman Scott Niedermayer have joined forces to coach a Squirt-level team that includes one of Johnson’s two sons (they also have a daughter). 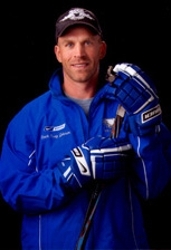 Craig Johnson lives in Irvine, Calif., and is the director of coaches for the Anaheim Junior Ducks. That Squirt team was in Detroit for a tournament when Johnson gave his players a glimpse into his Minnesota childhood. “We got eliminated in the semifinals of the tournament,” Johnson said. “The whole team went down to this local lake. They had it plowed off, and we started scrimmaging at 9 in the morning. We finally left at about 4 in the afternoon to catch our 7 o’clock flight. Father and son, sharing the same passion. What’s the expression? The puck doesn’t fall far from the hockey bag. Of all Johnson’s memories, playing the Russians in the Olympics, playing in the Stanley Cup playoffs, you name it, those days on Lake Como were the best. “I remember watching the fish through the ice,” Johnson said. “I couldn’t believe they didn’t freeze.